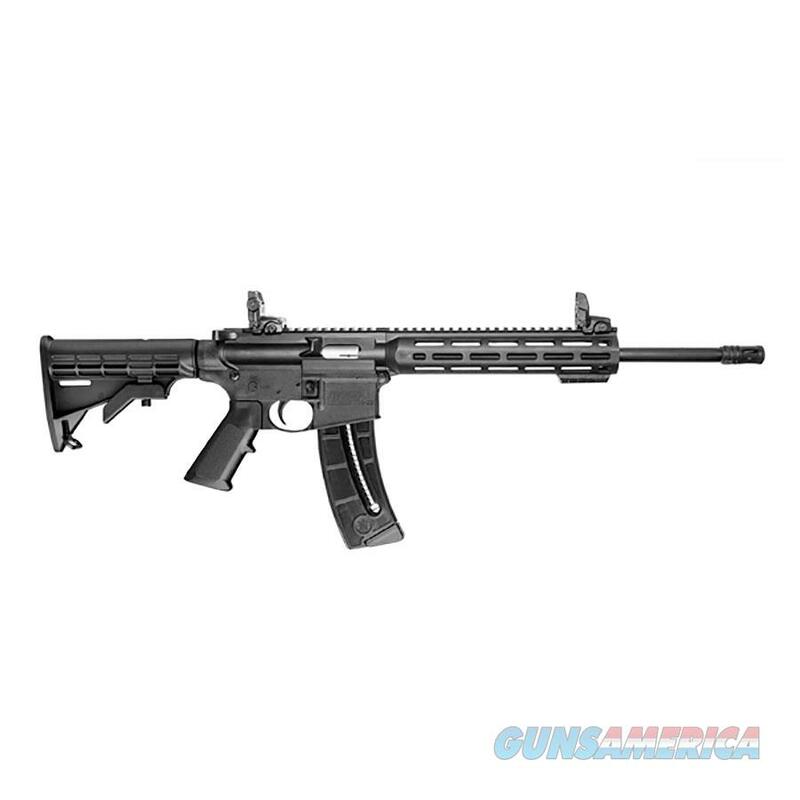 SMITH & WESSON M&P 15-22 SPORT •Finish: Matte Black •AR-15 styled blowback semi-auto •7# trigger pull •Lightweight, high-strength polymer receivers •Railed upper •Shell deflector •Carbon steel threaded barrel w/flash suppressor •M-LOK compatible 10" M&P slim handguard w/full-length top rail •Magpul MBUS folding sights•6-Position CAR stock •Receiver-mounted 2-position safety lever •Charging handle •Bolt catch •Recessed mag release •Includes 2" M-LOK rail panel •OAL: 30.70"-33.75" •Wt. : 5 lbs. We CHARGE A 3% Fee for Credit Cards. Cash Discounted Price Shown. Please have your dealer fax us their FFL to . You may check out online or please call us to check out. We are a Licensed FFL Dealer. All Federal Laws apply to us. Please take time to verify all information. Call if you have questions. We don't mind answering questions. WE DO NOT TAKE RETURNS UNLESS OTHERWISE NOTED IN THE DESCRIPTION. •	PLEASE MAKE SURE WHAT YOU ARE PURCHASING IS LEGAL IN YOUR STATE OR THAT YOU ARE SURE YOU WISH TO PURCHASE THIS ITEM. THERE IS A 25% RESTOCKING & RELISTING FEE FOR ANY GUNS PURCHASED THAT YOU EITHER BACK OUT ON THE PURCHASE AFTER PAYMENT OR THAT ARE NOT LEGAL IN YOUR STATE OR HAVE TO BE RETURNED DUE TO A FAILED BACKGROUND CHECK. •	ALL ITEMS LISTED ARE ALSO IN OUR STORE FOR SALE AND COULD SELL AT ANY TIME. It is possible the item could be sold before we remove it offline. We make every effort to get them removed as soon as an item sells in our store or on another website. •	We cannot modify an item that is not approved for your State. •	Wood grains vary with species for those guns with wood stocks, grips and/or forearms. If you want additional photos of the actual gun, please ask. •	Any damage to the item from shipping is the responsibility of the receiving shop to note and notify UPS or FedEx immediately. We are NOT RESPONSIBLE FOR SHIPPING DAMAGE or damage after it leaves our store. All items are shipped insured. •	R & R Gun Shop does not cover warranty issues. You must deal with the manufacturer for warranty issues or defects. •	Florida residents must pay Florida Sales Tax at our County rate of 7%. •	This item ships to lower 48 States only where allowed by law. Additional shipping charges will apply to Alaska or Hawaii. Please check with us on the UPS rates. •	Our payment policy is we expect to receive payment arrangements or at least contact with us within 48 hours after your purchase or win a bid regardless of the website rules. •	NO REFUNDS on NEW ITEMS. •	WE DO NOT REFUND SHIPPING COSTS for used firearms nor Credit Card Fees. •	By clicking on the purchase button or bid button, you agree to the terms and conditions as outlined that are in addition to the website rules. Thank you for doing business with R & R Gun Shop, we truly appreciate your business.